I learned a lot about myself and my relationship to money when we paid off $18,000 in debt in 18 months. We made some major changes to our life to make that happen. We worked extra jobs and clipped coupons. We wanted to set big crazy goals and watch them happen. Because our budget was extremely tight during those days, I began to really question needs and wants. I learned how much I spend frivolously thinking we NEEDED something in when in fact we didn't need it at all. I began to questions every purchase. If I spent our money with the purposes of NEED only, how much extra could we SAVE this year? How much more could we GIVE? This thought process continues to seep into many areas of my life, including our clothing budget. I no longer want closet full of clothes I don't wear. I want a purposeful wardrobe. I want to buy a few quality pieces that I can wear out. I started experimenting with capsule wardrobes last year. A capsule wardrobe is a small (usually 25 to 30) piece wardrobe. Each piece can mix and match providing you with a smaller but hardworking closet. The thought behind this idea is that you don't NEED many pieces of clothes to dress well. It takes the decision fatigue out of what to wear each day. Although I loved this idea, I felt pressed to go smaller. I wanted to try a 10 piece capsule this fall. I wrote about it here: My 10 piece Fall Capsule Wardrobe. I am loving this capsule more than any other one I've created. A ten piece wardrobe CAN give you plenty of outfit possibilities. I use the Stylebook app to help me generate ideas. I love this app. You can take pictures of your clothes and add your pieces into the app. It will automatically tell you how to wear each piece. It is fantastic! It is $3.99 and well worth the money. You can grab the app below. They also have a man's version of the app. You can get it here. If you are looking for a simple, minimalist, and stylish capsule wardrobe, I have it for your here. I'll show you just how versatile a 10 piece can be. You can create many different outfits with these pieces. I literally couldn't believe it. Don't believe me? check out what we've come up with! I love a good pair of boyfriend jeans. You can dress them up for a night out or throw on a t-shirt and tennis shoes for a day of errands. They are comfortable and super versatile. The trick with boyfriend jeans is to find a pair that flatter YOUR body. So try on a lot of pairs! Once you find a pair that works, go with it! My favorite is Madewell boyfriend jean (tip: I got mine on sale for $35 online). Gap now has Best Girlfriend Jeans (see above). I think these jeans are so much better than the original boyfriend jeans they carried last season. The sweater is a splurge for J.Crew I got on sale. I love the color. My t-shirt is from the Gap and my jacket from Old Navy. I picked a dark pair of skinny jeans for this 10 piece capsule because skinny jeans can do everything! I love to wear mine with a tunic or short dress. 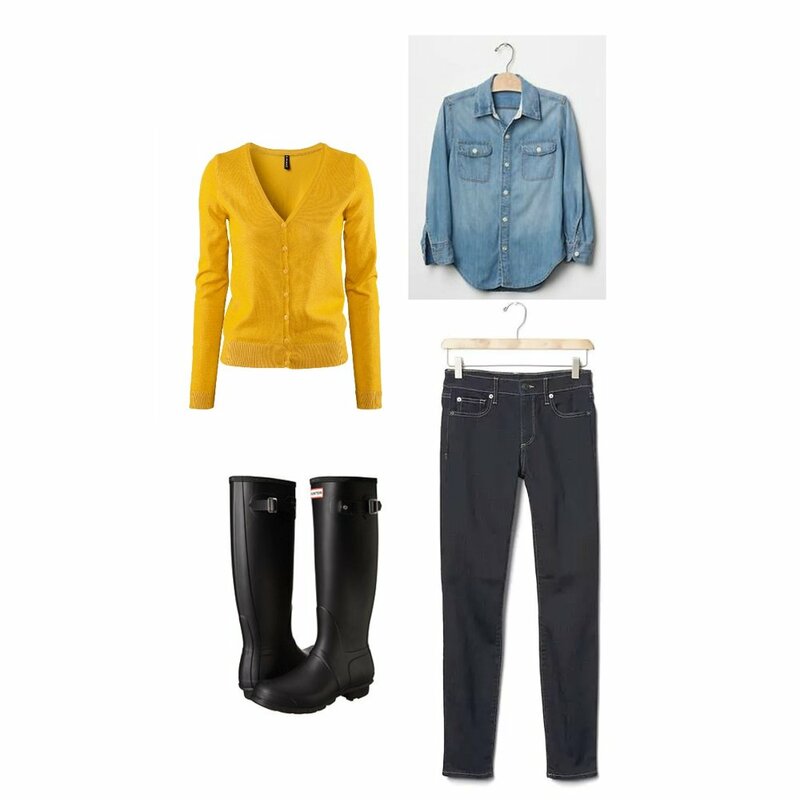 You can pair your skinny jeans with a sweater and rain boots on a rainy fall day. You can also dress your skinny jeans up with a blouse and wedges. My skinny jeans for this fall are from the Gap. I think Target's Denizen brand are great if your budget is tight. If you have the room in your budget, I recommend Madewell. My blouse is from the Gap. I got my rain boots for a Christmas gift 3 years ago and LOVE them. My wedges are TOMS. They continue to be a closet staple. As soon as I learned about Francis and Benedict, I knew I would buy a skirt from them. I love using my purchasing power to help others. The new season of skirts is gorgeous. Go check it out and get one. You can dress a skirt down with a simple t-shirt and tennis shoes for errands or a slow day at home. Throw on a simple blouse and wedges for church or a night out! I love this shirt-dresses. They are comfortable and flattering. I like to wear mine with jeans (see above) or all alone. I paired mine with wedges for a dressier look or a simple jacket and tennis shoes for a more casual look. If your dress is too short, grab a skirt extender like this one! I only included 10 outfit ideas here, but I have about 10 more in my Stylebook app. Ten pieces really are enough for a cute and versatile capsule wardrobe. You can read more about how I picked each piece in this post: My 10 Piece Fall Capsule Wardrobe. Could you make a capsule with only 10 pieces? What pieces would YOU choose? Let us know! Do you wake up every morning wondering what to wear? Do you have a closet full of clothes but no clue how to put an outfit together? We are taking all the guesswork out of what to wear this summer. We put together 10 comfortable and stylish outfits you can wear this summer. We offer each outfit at many different price points to fit any budget! Do you have a closet full of clothes, but have trouble getting dressed each day? Do you struggle to find clothes you love that work within your budget? We've taken all the guesswork out of shopping for clothes. We've created this simple, stylish, budget-friendly summer capsule wardrobe. We have 25 pieces that will keep you cool and looking great this summer! Do you have a basic winter wardrobe? We created a stylish and budget friendly 30 piece winter wardrobe you will love. Each piece will mix, match, and layer beautifully to create endless outfit possibilities. Do you need some simple cool weather outfit ideas? Do you have a closet FULL of clothes but no idea how to wear thing? Do you need some new outfit ideas this fall? Here are my 4 simple outfits for Fall or Winter. They are stylish and budget friendly. We giving options for every budget. Create a simple personal uniform you can feel good in.